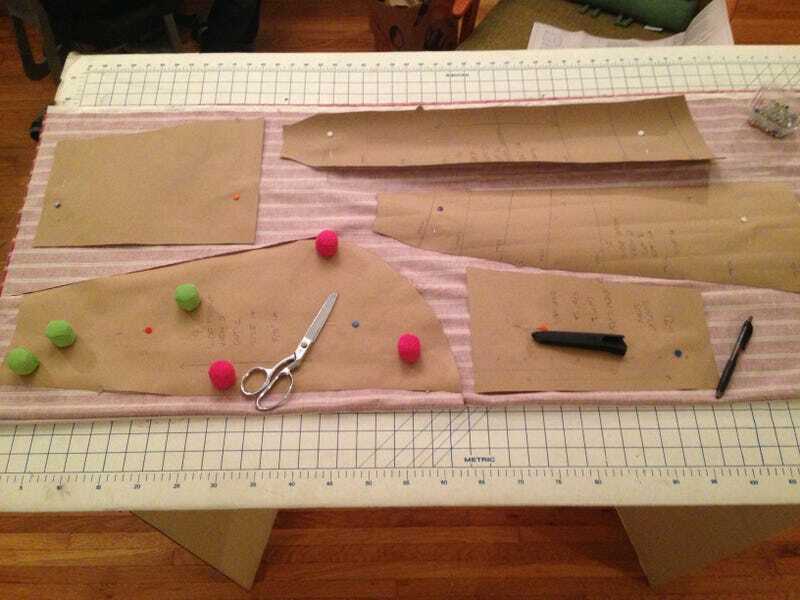 The cutting of the fabric begins! As you may notice, I use sewing weights. "Oh!" I hear you say. "What is a sewing weight?" Sewing weights are awesome. Sewing weights make pins nothing more than a bad, pointy memory. Well ... ok, I still use a few pins. But rather than pinning down the edges of my pattern piece to the fabric, having it buckle and deform, and then trying to cut the damn thing out, I simply place a few pins in the middle of the pattern piece, and then use weights along the edge to keep everything nice and stable. SO MUCH EASIER. The pins in the middle keep the pattern piece and fabric together so I can transfer markings, but that's all they're there for. So, if you didn't know about sewing weights before, now you do! They're a real timesaver. Also, you can use just about any small heavy thing for a weight. You don't have to buy a damn thing. Ziplocs of washers or BBs work really well, if you happen to have some lying around.